When we first met the Boxster in 1997, it was lauded as a more affordable but still very capable Porsche model. Often referred to as the “poor man’s Porsche”, it quickly became apparent that the Boxster was more capable than many expected, particularly when the road was no longer straight. Many of these characteristics remain intact, even if this car has evolved enormously since then. Sure, it’s still the most affordable Porsche car – but it starts (in this configuration) at over $67,000. And yes, it’s still as capable as ever – many argue that it’s a much more dynamic and enjoyable driving experience than other, more expensive Porsche cars which will remain unnamed. That’s hugely subjective, but what is not is that the Boxster has always been a fun and competent car – and it’s better than ever. The most recent version is called the 718 Boxster. The 718 is Porsche’s mid-engine platform – the Boxster is the convertible while the Cayman is the hard-top coupe. If you need more performance, you can bump those models up to the “S”, which adds power and cost to the equation. The Boxster is not only a benchmark sports car. It’s a great-looking car too – even with the top up. It’s low, wide and sleek. The lines are simple and uninterrupted save for the side air intakes. Even in my car’s somewhat sedate Agate Grey metallic paint, this Boxster garnered a ton of attention – as Porsche cars tend to do. The optional 19-inch rims are lovely and absolutely worth it in terms of aesthetics. I love the 3D Porsche lettering at the rear end – it’s one of the key ways for the uninitiated to tell the 718 apart from its predecessors. And that boxy single exhaust outlet looks serious. I love the little details too – like the four brake “spot lights” that are incorporated into the LED tail light pods. The biggest hoopla that surrounded the announcement of the new 718 was the switch from the thrilling flat-six to a new, smaller turbo-charged flat-four engine. A lot of Boxster and Cayman enthusiasts cried foul, and one or two of their issues deserve merit – or at least consideration. I’ll get to that in a moment. But first, let’s talk facts. The 2L boxer still sits amidships, directly behind the seats. It puts out 300HP at 6500 RPM. Torque is rated at 280 lb.ft and it’s all available at 1950 RPM. That makes it significantly more powerful than its predecessor. Is it fast? You bet it is. There is a tiny bit of lag off the line, but a split second later, the turbo is alive and well, and the power pours on in an incredibly satisfying, linear fashion whether you’re putzing around town or putting the hammer down all the way. How fast is it? Equipped like the one I reviewed, the Boxster will run from 0-100 km/h in 4.7 seconds, thanks to the optional 7-speed PDK transmission and the Sport Chrono package. Neither of these is an absolute necessity because with a manual transmission and no Sport Chrono, it still pulls off that sprint in 5.1 seconds. With that said, I want to give the seemingly pricey and often misunderstood Sport Chrono package a shout-out. Check off this option and you’ll get that fancy-shmancy stopwatch on the dash, but it’s what is underneath that really counts. The package also adds a rotary steering-wheel-mounted drive mode selector (and the Sport+ mode), launch control, dynamic transmission mounts and the performance display on the digital gauge. If you like to have fun behind the wheel, this is a package I’d recommend. That rotary dial allows you to move between Normal, Sport, Sport+ and the customizable Individual modes. Sport and Sport+ are progressively transformative, bumping up the 718’s responsiveness and transmission programming to become noticeably more aggressive and dropping a bit more bass and authority into the exhaust note. The PDK transmission is my industry favourite – I consider it nearly flawless. It’s extremely quick, the programming is perfect in virtually every driving situation and it remains smooth at all times. You can take over shifting duties, manually changing gears at lightning speeds with the shift paddles or the gear selector. Those issues I mentioned earlier? Well, the new four cylinder isn’t as immediate in its response as the six was (but half a second later, you’ve got more power on tap than ever before and it’s much quicker) and then there’s that exhaust note. It’s a personal thing, but I miss the frenetic, guttural howl that was part of the flat six experience. The new engine and its exhaust are notably quieter and sound more “slightly-tuned-Subaru” than anything else. Regardless, it’s still a fantastic sound and broadcasts the car’s power and intentions far and wide when it is in Sport mode. In terms of other sounds, the Boxster is a bit noisy – wind noise is very well suppressed with the top up, but you’ll always have road and engine noise coming into the cabin. It’s part of the car’s character and frankly, it would be weird without it. Porsche’s mid-engine layout has always been the key to the Boxster and Cayman’s remarkable agility. The 718’s mid-engine chassis’ appetite for curves is more evident than ever. Incredibly sharp, quick and direct steering comes back with crystal clear feedback. The Boxster stays flat around corners and feels as though it is rotating around a pivot point rather than turning like a mere mortal car would. I’m having a difficult time thinking of a vehicle I’ve driven that was so eager to change direction at my request. Braking is a breeze with hugely powerful binders that haul things down from illegal speeds to a full stop with nary a hint of drama, and there is no sign of fade after repeated stops. Visibility out of the Boxster isn’t the greatest. Of course your view of the road ahead is perfect, but looking out of the back or shoulder checking with the top up is a bit anxiety-inducing. Thank goodness for the rear-view camera when it comes to parking. Sure, the 718 would be a fantastic partner on track day, but I love that it is equally competent for the daily commute. Not only is it composed in bumper-to-bumper traffic (although the engine’s thankfully-defeatable auto start/stop feature could be smoother), it also rides smoothly and shifts seamlessly. And the cabin is as comfortable a place to be as any. The materials are nice and fit and finish appears to be outstanding as one should expect from Porsche. The incredibly supportive heated Sport seats are also a very agreeable place to rest your nether region for extended periods, including longer highway jaunts. The steering wheel feels ideal with its fat, grippy rim and there is a dual-zone automatic climate control system to keep both driver and passenger happy. Porsche’s latest infotainment system is a vast improvement. The touchscreen’s interface is augmented with a couple of knobs and some hard buttons, and the whole system is relatively easy to use. The BOSE stereo is fine, (USB and auxiliary inputs are in the glove compartment) but really, who cares when the real sound system is revving up just inches behind your elbow? Speaking of highway jaunts, I would actually say the Boxster qualifies as a reasonable road-tripper. The ride is outstanding on the highway, and its front trunk is large enough to swallow a significant amount of stuff. We did a weekend pizza run where we determined that you could fit 8 large Panago pizza boxes in the front, making this a practical pizza delivery vehicle as well. The 718’s mid-engine configuration nets it additional cargo space in the form of a small trunk at the back too – it would easily accommodate a few more soft bags and even did well during our grocery-getting efforts. Dropping the top (or raising it) takes about 9 seconds and can be done while driving at lower speeds. There is some minor buffeting at freeway or higher speeds, but nothing untoward – it’s an excellent convertible driving experience overall. I found the head room to be quite generous with the top up. Porsche’s answer to the cupholder question still appears to be “you don’t need a freaking coffee when you’re driving a Porsche” as the hilariously overengineered solution continues to place the driver’s drink directly over the console’s touchscreen and electronics area, pretty much ensuring that you’ll spill some of your drink on these sensitive bits. Best to drive your Boxster to the coffee shop, enjoy your drink there, and be on your way. Fuel economy is rated at 11 L/100 km in town and 8.3 L/100 km on the highway. I averaged 12.5 L/100 km making no attempt to drive economically and often driving with a slightly heavier foot. Let’s get the price thing out of the way. They’re not giving Porsches away. They’re not cheap. And even though the Boxster starts in the mid-$60,000s, I have no doubt that you could probably get close to doubling the price if you succumb to the age-old Porsche temptress, the option sheet. And yes, the Boxster S would be sweet indeed, but I’m not convinced the extra power is worth the extra money. Regardless, nobody is surprised when it comes to paying for a Porsche. As our friends in Game of Thrones would say, “It is known”. The 718 Boxster is simply at the top of its game. It is a sports car that others should be judged by, and outperforms nearly anything else out there. No, it’s not as fast as some cars that cost less. But the overall package borders on perfection. It comes across as remarkably cohesive, with no part of the driving experience feeling compromised. It’s fast, fun, capable, efficient and even (for a two-seat convertible) practical. WAF (Wife Approval Factor) was very high, which surprised me. She’s normally not a coupe girl, never mind a convertible fan. But she loved the Boxster, and even asked for a top-down driving date. It seems that the 718 Boxster has what it takes to captivate almost anyone. You won’t find a better sports car for the money, other than perhaps the Corvette – which nobody is cross-shopping with the 718 anyway. 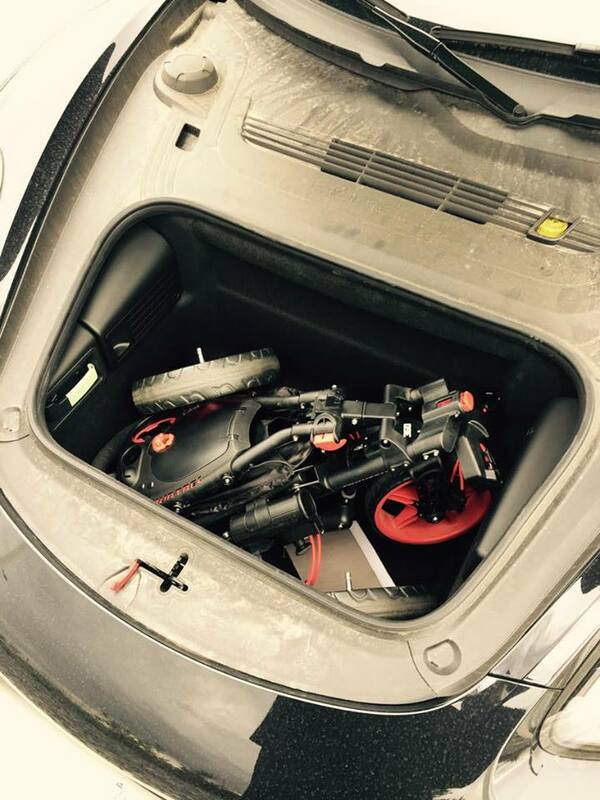 Disclosure: Vehicle was provided by Porsche Centre Edmonton. Contact Christian Gersdorff there when you’re ready for your own 718. Or any other Porsche. 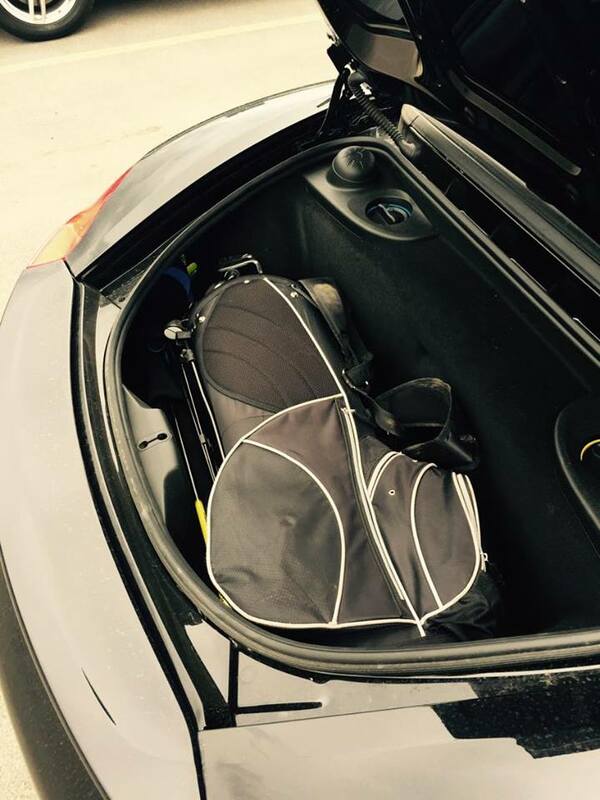 If you’re a golfer, it’s notable that you can bring a full tour bag and the cart to carry it with in your Boxster. Check out these pictures from the dealership.